TORONTO, ONTARIO--(CCNMatthews - Jan. 29, 2007) - ANDINA Minerals Inc. (TSX VENTURE:ADM) ("Andina") is pleased to announce that it has entered into an option agreement to acquire the 3,000 hectare Valeriano Project located in Chile's Region III, 120 kilometres east of Vallenar and 30 kilometres north of Barrick Gold's Pascua-Lama Project. Since the early 1980's, the Valeriano Project has been the focus of a number of exploration programs by senior mining companies, including Exxon Minerals, Phelps Dodge and Newmont. Between 1996 and 1999, Barrick Gold was engaged in an exploration project on the Property which included 12,600 metres of drilling. The combined results from the previous exploration campaigns are sufficient to warrant further exploration. The target of the previous exploration programs was a series of alteration systems cutting Palaeozoic to Triassic volcanics and Tertiary volcanics and intrusives which underlie the Valeriano Property. Two types of alteration have been reported: epithermal high sulphidation systems with enargite and tennantite; and, mesothermal-type alteration with quartz-sericite-pyrite +/- tourmaline. A number of geochemical anomalies associated with alteration systems, possibly related to Maricunga-style gold porphyry systems, remain untested and will be the initial focus of Andina's exploration activities at Valeriano. 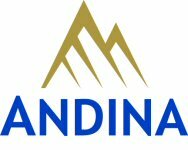 Andina may earn a 100% interest in the Valeriano Project by issuing the vendor 350,000 common shares of Andina by July 9, 2008 and a further 650,000 shares by July 9, 2009. There are no minimum exploration expenditures. Upon the signing of the option agreement, a cash payment of US$100,000 was made to the vendor. The final terms of the option agreement are subject to necessary regulatory approvals. Andina also announces that it has granted an aggregate of 230,000 options of which 200,000 were granted to the Chief Financial Officer and 30,000 to consultants. The options are exercisable at $3.00 and expire on January 16, 2012. This release contains forward-looking statements, including predictions, projections and forecasts. Forward-looking statements include, but are not limited to, statements with respect to exploration results, the success of exploration activities generally, permitting time lines, government regulation of exploration and mining operations, environmental risks, title disputes or claims, limitations on insurance coverage and the timing and possible outcome of any pending litigation. Often, but not always, forward-looking statements can be identified by the use of words such as "plans", "planning", "expects" or "does not expect", "continues", "scheduled", "estimates", "forecasts", "intends", "potential", "anticipates", "does not anticipate", or "belief", or describes a "goal", or variation of such words and phrases or state that certain actions, events or results "may", "could", "would", "might" or "will" be taken, occur or be achieved. Forward-looking statements involve known and unknown risks, future events, conditions, uncertainties and other factors which may cause the actual results, performance or achievements to be materially different from any future results, prediction, projection, forecast, performance or achievements expressed or implied by the forward-looking statements. Such factors include, among others, the interpretation and actual results of current exploration activities; changes in project parameters as plans continue to be refined; future prices of gold and copper; possible variations in grade or recovery rates; failure of equipment or processes to operate as anticipated; labour disputes and other risks of the mining industry; delays in obtaining governmental approvals or financing or in the completion of exploration, as well as those factors disclosed in the company's publicly filed documents. Although Andina has attempted to identify important factors that could cause actual actions, events or results to differ materially from those described in forward-looking statements, there may be other factors that cause actions, events or results not to be as anticipated, estimated or intended. There can be no assurance that forward-looking statements will prove to be accurate, as actual results and future events could differ materially from those anticipated in such statements. Accordingly, readers should not place undue reliance on forward-looking statements.